Mark Z Danielewski, "The Familiar, Volume 1: One Rainy Day in May"
The Book Cellar is proud to host author Mark Z Danielewski! Mark burst onto the literary scene in 2000 with his ferociously ambitious debut novel, House of Leaves, which went on to win the first NYPL Young Lions Fiction Award and has sold more than half a million copies. We continue to sell an amazing 50,000 a year of House of Leaves. His reputation has grown in the last 14 years: Only Revolutions was a finalist for the 2006 National Book Award and The Fifty Year Sword was turned into an annual Halloween show at the Walt Disney REDCAT Theatre featuring five voices and large-scale shadow puppets. Now, Mark is embarking on his most ambitious, experimental project yet: a 27-volume novel about a girl and her cat. Mark says of his novels: “If House of Leaves tackles the movie, Only Revolutions music, and The Fifty Year Sword the campfire story, then The Familiar will show how the novel can stalk, take down and devour the television series.” The Familiar: One Rainy Day in May (onsale 5/12/15) is the pilot to a 27-volume story taking us from Los Angeles to Mexico, from Singapore to Texas. It features a wide range of characters including a therapist-in-training whose daughters prove far more complex than her patients, a gang member hired to kill two scientists on the run in Marfa, a recovering addict in Singapore, a programmer near Silicon Beach. At the very heart of the story is a 12-year-old girl who one rainy day sets out from Echo Park to get a dog only to find a different kind of creature, one which will not only alter her life but threaten the world we all think we know and the future we take for granted. Mark grew up in various places, including NYC, went to Collegiate High School and Yale University, and now lives in Los Angeles. His sister is the singer Poe and in 2000, the two toured across the US together opening up for Depeche Mode and promoting Poe’s album Haunted which incorporates elements of House of Leaves. His father, Tad Danielewski, was an avant-garde film director and teacher. Avid Bookshop presents a very special Halloween treat from one of our booksellers! As a lead-up to the downtown Wild Rumpus, Nick Splendorr will read The Fifty Year Sword, an hour-long ghost story by Mark Z. Danielewski (House of Leaves, Only Revolutions, and next spring's The Familiar). Come in your costumes ready for the Wild Rumpus! We'll all go downtown to join the parade afterwards! "One Halloween night, at a party held at an East Texas ranch house, a local seamstress named Chintana finds herself thrown into the role of chaperone for five rambunctious orphans. Not surprisingly, the children’s energies prove barely containable, even with promises of cake and a storyteller. The storyteller, however, is not what anyone expects. Looming and cloaked in dark, he entertains the orphans with a tale twisted out of vengeance and violence. He does not come empty-handed, either. At their feet he sets a long, narrow box sealed with five latches. An unsettling thing to say to anyone, especially to children. But as Chintana soon discovers, this is just the beginning. Her concerns only mount as the storyteller offers more and more menacing details about what consequences lie hidden within that long, narrow box. Presentació del llibre La casa de hojas, de Mark Z. Danielewski. Participaran a la presentació Ana S. Pareja, editora d'Alpha Decay; Javier Calvo, escriptor i traductor de l'obra i Robert Juan-Cantavella, escriptor i maquetador de l'obra. Author of House of Leaves and Only Revolutions will be reading, signing and discussing his third novel The Fifty Year Sword. Skylight Books will be the final stop on his tour and has promised a "giveaway of some kind" at the event. Enigmatic and thrilling: classic Danielewski style. Mark Z. Danielewski was born in New York City and now lives in Los Angeles. He is the author of House of Leaves and Only Revolutions. MGRB staff favorite Mark Z. Danielewski has explored the power of storytelling not only through the content of words, but also the format of the physical story (e.g. multiple narratives, foot notes, etc.) since his cult-classic bestselling debut, House of Leaves. Originally published as a limited edition and subsequently performed only on Halloween night as a live shadow show, the novella The Fifty Year Sword is finally available in hardcover complete with newly stitched illustrations and autumnal quotations marks. The nationally best-selling author of House of Leaves and Only Revolutions has crafted a powerfully chilling novella: a ghost story for grownup readers, originally published in a small edition and only now available for wider audiences. In this story set in East Texas, a local seamstress named Chintana finds herself responsible for five orphans who are not only captivated by a storyteller's tale of vengeance but by the long black box he sets before them. As midnight approaches, the box is opened, a fateful dare is made, and the children as well as Chintana come face to face with the consequences of a malice retold and now foretold. Danielewski presents a staged reading of the novella, with original music composed and performed by world-renowned pianist/NPR host Christopher O'Riley. Free admission. St. Joseph’s College is located at 245 Clinton Avenue. Staff will direct guests to the Tuohy Auditorium, and Danielewski will sign copies of his books following the reading. Join us for an atmospheric pre-Halloween event! Please note: Customers who purchase Danielewski's new novel The Fifty Year Sword from Greenlight will be given priority in the signing line. Upon purchase (either online, in store, or at the event), each customer will be assigned a pass with a "group number" indicating his/her place in the signing line. Passes will be assigned on a first-come, first-serve basis. Books and passes may be picked up in the bookstore on or after the book's publication date, October 16, or at the event. Customers without passes (did not buy their copy from Greenlight) and those with large quantities of books may be asked to wait at the end of the line for signing. Mark Z. Danielewski was born in 1966. House of Leaves is his debut. 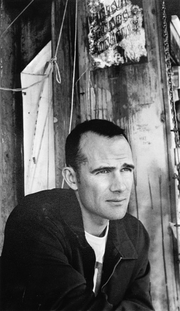 Mark Z. Danielewski is currently considered a "single author." If one or more works are by a distinct, homonymous authors, go ahead and split the author. Mark Z. Danielewski is composed of 17 names. You can examine and separate out names.